Dinnertime rolled around and I was really craving Indian food. There’s a well-rated bistro nearby, but I wouldve had to leave and also dish out additional money for the meal. Sometimes I am happiest when I can satisfy a craving all with ingredients I have at home and use up ingredients I already have. 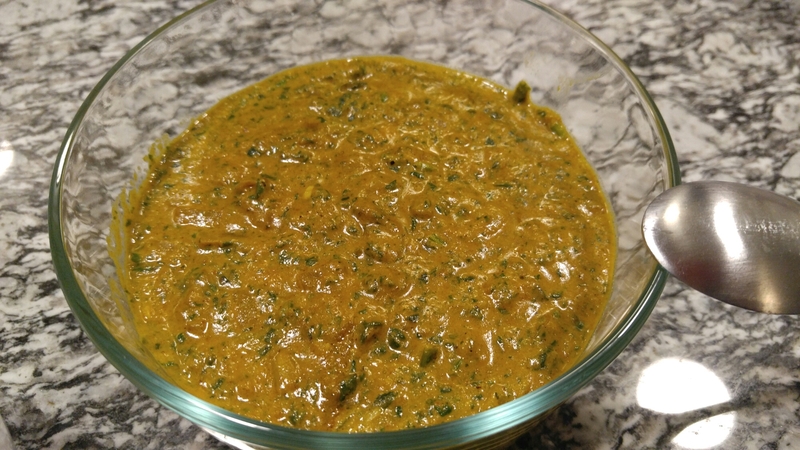 Lucky for me I had just about all of the ingredients to make an Indian saag (spinach) curry. I would’ve liked to have paneer (cheese cubes), to make it a saag paneer curry, but no such luck! I based my curry after these ingredients making substitutions with things that I have. For example, I added dried fenugreek, coconut milk, and tomato paste instead of the fresh fenugreek leaves, heavy cream and fresh tomato. I was really pleased with the end result. The coconut milk added a lot of creaminess. The flavor was really vibrant and the fresh ginger and garlic really made it pop. I loved the sweetness the onion added and the baby spinach was delicate. It was fun to make this dish and I would definitely make it again.